The Titleist Scotty Cameron Futura X putters are constructed with a precision milled 6061 aluminum body and feature T-shaped sight lines for effortless alignment. The unique head design features advanced perimeter stability weighting which combines a balance bar with deep heel-toe weighting and additional perimeter weighting under the face. In addition, the mid milled face provides a soft feel and sound while the frozen titanium finish combined with the red-dot graphics create a modern appearance. 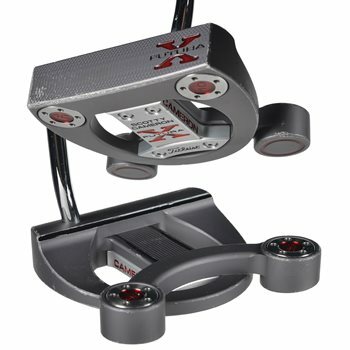 The Futura X putter provides unmatched stability while delivering a great roll.